NORTON, MA. – January 21, 2015 – Measurement Computing Corporation today announced the release of the E-1608, an Ethernet-based multifunction Data Acquisition (DAQ) device. The E-1608 provides both analog and digital I/O and is priced at $499. The E-1608 features 250 kS/sec sampling and 16-bit resolution. It offers eight analog inputs, eight digital I/O, one counter input, and two analog outputs. The device is supported in Windows® and Android™ operating systems and will add Linux® support in the near future. An OEM board-only version is also available. Microsoft® Windows software options for the E-1608 include DAQami and TracerDAQ® to display and log data, along with comprehensive support for C®, C++®, C#®, Visual Basic®, and Visual Basic .NET™. Drivers for DASYLab® and NI LabVIEW™ are also provided. Android support the E-1608 allows users to develop DAQ applications for tablets and smart phones. Free sample applications are available for download on Google Play™. 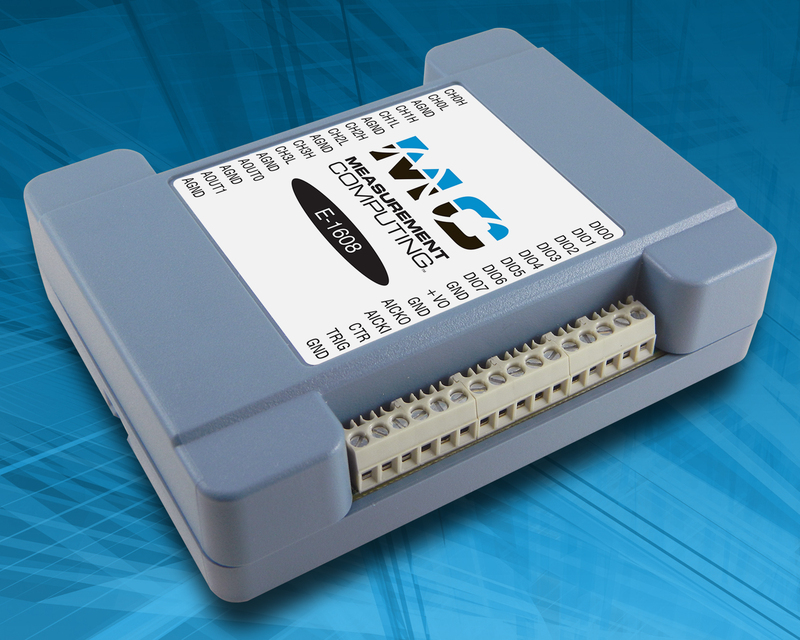 Measurement Computing designs and manufactures data acquisition devices that are easy to use, easy to integrate, and easy to support. Included software options are extensive and provided for both programmers and non-programmers. We offer high-quality, reliable products, backed by one-year limited warranties and a harsh environment program. More information about Measurement Computing is available at www.mccdaq.com.